"Are You Seeking Low Cost Garage Heat? Then Consider Electric Infrared Heaters!" 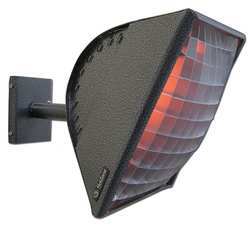 Infrared heaters are the least first cost heating units that you can install in your garage. They are exceedingly versatile when it comes to arrangement and easy to install. They can be ceiling mounted or mounted from high on a wall and angled down toward the floor area that you want to heat. We will cover three models that require only 120V-AC power that can have your garage warm in no time. The nice thing about infrared heaters is that you are not heating the air, but objects. The more mass an object has the more infrared heat it will absorb. It doesn't matter how much air-space the infrared waves have to travel through, they only activate when they hit the density of mass objects. Your garage floor made of concrete, is a great example. The infrared waves hit the concrete and begin heating it. As a wave of light, infrared is not subject to gravity so it's direction of travel is not limited other than where you direct it. Furnace heated air always rises above colder air because air (oxygen) is a gas. If it's temperature is colder than the ambiant air temperature surrounding it - it will drop because it is a heavier gas. The exact opposite occurs with every type of radiant energy where heat is made from pure energy that only is attracted to colder energy such as a concrete floor slab, workbench, automobile, or any of the other items in your garage. The old saying goes: If your feet are warm, then you are warm. Walking on a warm garage floor heated by infrared light waves can accomplish that. It also melts ice and snow from your cars quite handily as the heat-energy stored in your garage floor radiates up toward the cold-energy of the ice / snow pack on your vehicle. The Fostoria model shown at the left is a great example of a small infrared heater for your garage. It comes standard with two (2) 2" long chains and 4 "S" shaped hooks for easy ceiling mount installation. Its light weight of 10 pounds allows for it to be mounted to a drywall ceiling using expansion bolts without worry about hitting solid wood material. The unit puts out 5120 BtuH using 12.5 amps on single phase power that delivers 120V-AC current. 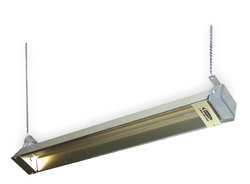 It is 41" long, 5-3/8" wide, and 6-1/2" in height and outputs a beam pattern of 60 using one lamp. The housing is painted steel in a brown powder coat. It has a 6' power-cord length, or it can be hard wired into a junction box. The Model OCH-46-120V-G sells for under $200.00 and requires a thermostat that is sold separately. If you don't have gas or 240 volt service to your garage, this unit is a great choice. It is small enough that you can arrange multiple units throughout your garage in the areas exactly where you need the heat. If you have a small one-car garage, two of these units would probably do-the-trick. The Fostoria model shown at the left is a slightly longer version of the model featured above only in a stainless steel housing. It has all the same electrical features and requirements of the model listed above with the same BtuH output. If you have a moist environment in your garage or are using solvent based chemicals or sprays, you may want to invest the additional $100.00 for the stainless steel housing over the painted version. Both of the Fostoria models shown above are UL® compliant for Canada and the United States and made in the U.S.A. The HotZone infrared heater shown at the left can be ceiling or wall mounted. The unit puts out 5120 BtuH using 12.5 amps on single phase power that delivers 120V-AC current. It is 16-1/2" long, 14" wide, and 14" in height and outputs a beam pattern of 60 circular using one lamp. The housing is aluminum in a powder coat finish. The unit is hard-wire only to a universal wall/ceiling junction box and comes with a box-mount. This unit has a patented infrared lens and weighs 8.51 pounds and is made in the U.S.A. The heating unit is ETL compliant. The HotZone model offers a great deal of versatility when it comes to spot-heating as it can be mounted nearly anywhere. It can be mixed-in with the Fostoria type models shown above to effect a perfect heating-pattern for any garage, large or small. The unit retails for under $475.00. The unit can be wired to a individual or gang thermostat which is sold separately. There is no doubt that infrared heaters have a great advantage in that their low first-cost and ease of installation makes them very desirable. Since you are not attempting to heat air, their operating cost is very competitive based upon the short wavelength technology that they utilize and are a good choice for any residential garage owner.